It is a pleasure to announce that the Think Tank 3 Summary Report just arrived in cIRcle, UBC’s Digital Repository! According to cIRcle statistics, it has been accessed and/or downloaded by the following “Top Country Views”: Canada, United States, Belgium, Australia, Germany, France, and the United Kingdom so far. The report covers five core themes: operationalizing sustainability; enhancing human well-being; green venues/buildings; measurement and certification; and, business case of sustainability. Read the full report via cIRcle at: http://hdl.handle.net/2429/45598. 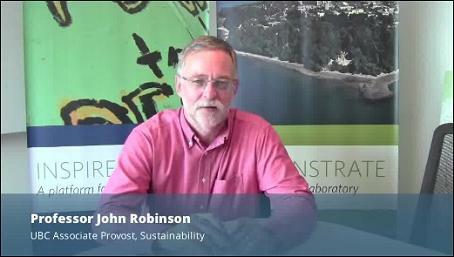 In case you missed it, Professor John Robinson, Associate Provost of UBC Sustainability, presented strategies on sport and sustainability at the Think Tank 3: Program event. This event, hosted by the UBC Centre of Sport and Sustainability on 26-27 September 2013, can be viewed and/or downloaded in cIRcle at: http://hdl.handle.net/2429/45586. 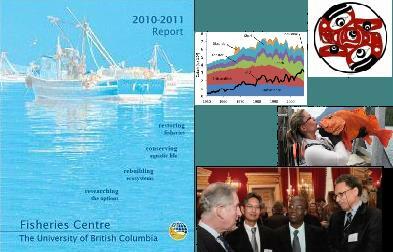 The years 2010 and 2011 have been very exciting for those of us here at the Fisheries Centre. We welcomed two new faculty members, increasing the number of faculty at our Centre to twelve. First, we hired Dr Sang-Seon Yun, who comes to us from Kunsan National University in Korea, and is working with the Aboriginal Fisheries Research Unit in examining chemical communication systems of fishes. We also welcomed National Geographic Fellow Dr William W.L. Cheung, who obtained his PhD at UBC in 2007 and has returned to work on global change biology and fisheries. The year 2011 also included the launch of a new website and visits from very distinguished guests thus helping the Fisheries Centre to ‘persevere in [its’] scholarly productivity and outreach efforts, with the goal of cultivating local and international fisheries awareness’. Click on ‘View/Open’ to read the rest of the report in cIRcle at: http://hdl.handle.net/2429/43679. There are 190+ items in the Fisheries Centre collections in cIRcle. 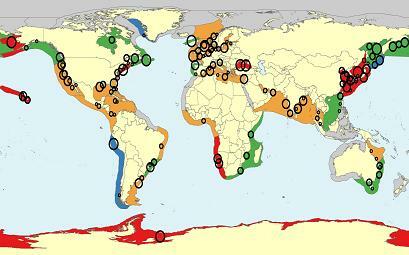 Explore these titles – Modelling the trophic role of marine mammals in tropical areas (2009); Total marine fisheries extractions by country in the Baltic Sea: 1950-present (2010); Trade in seahorses and other syngnathids in countries outside Asia (1998-2001) (2011) and more. Or, browse the Fisheries Centre collections by Author, Title, Subjects and By Dept. Affiliation. Hosted by the UBC Reads Sustainability Lecture Series. Ozzie Zehner is the author of Green Illusions and a visiting scholar at the University of California, Berkeley. His recent publications include public science pieces in Christian Science Monitor, The American Scholar, The Humanist, The Futurist, Women’s Studies Quarterly and The Economist as well as educational resources in Green Technology (Sage, 2011) and Green Culture (Sage, 2011). Zehner’s research and projects over the previous two decades have been covered by CNN, MSNBC, USA Today, Science News Radio, The Washington Post, Business Week and numerous other media outlets. He also serves on the editorial board of Critical Environmentalism. Zehner primarily researches the social, political and economic conditions influencing energy policy priorities and project outcomes. His work also incorporates symbolic roles that energy technologies play within political and environmental movements. His other research interests include consumerism, urban policy, environmental governance, international human rights, and forgeries. The Senate Committee on Energy and Natural Resources resumed it’s Hearing May 12th, 2010 to review current issues related to offshore oil and gas development – you can view the archived webcast of the Hearing. Take a look at the US government response timeline. Take a look at the Deepwater Horizon Response site, which gives up to date news and video on how events are progressing. Read the Globe’s article: Moderator’s skipped question on Gulf oil spill at Harper forum. Confirming our commitment to the Heritage Contract, to ensure B.C. ratepayers continue to receive the benefits of B.C.’s low-cost electricity assets. Moving forward on critical infrastructure projects such as Site C and the Mica and Revelstoke upgrades. Increasing B.C.’s clean energy supply to meet domestic and future export demand. Better align implementation of policy between BC Hydro and BCUC and review the need for a separate transmission corporation. Enabling utilities to implement initiatives to reduce greenhouse gas emissions and/or improve energy efficiency, such as encouraging installation of high-efficiency heating systems like heat pumps or vehicle electrification and charging infrastructure. Creating a First Nations Clean Energy Business Fund to support revenue sharing opportunities and to increase First Nations participation in clean energy resource development. For another opinion read the article What Voters weren’t told about the Clean Energy Act from the Tyee. *Trial Subscription* Trial ends February 26, 2010. Please visit the new GREENR Knowledge Portal from Gale and then send us your thoughts using this comment form. With enough feedback we may be GREENR longer. GREENR (Global Reference on the Environment, Energy, and Natural Resources) is a new, authoritative online resource that focuses on the academic study of sustainability and the environment. Environment & Safety Library : “The Library combines powerful, easy-to-use, continuously updated compliance tools with a research collection of [mostly U.S.] federal and state laws, regulations, and documents.” NOTE -we do not have access to grayed-out text.